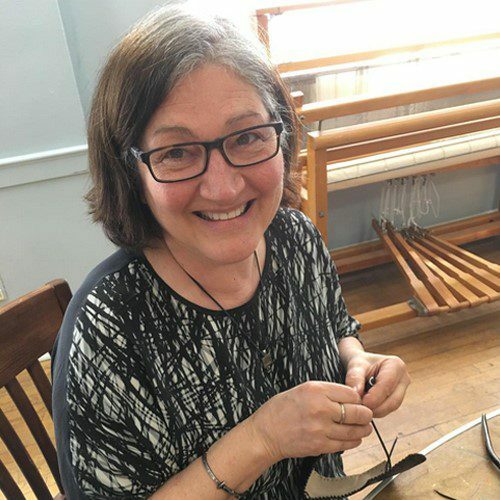 Molly Grant began leatherworking in her early 20’s, first by working on her own and then by apprenticing at the Black Swan Leather shop in Portsmouth, NH, where she learned the basic skills of traditional leatherworking. She first saw Cordwainer Shoes when she was ten years old at the League of New Hampshire Craftsmen’s Fair, known nationally as the oldest craft fair in the nation. She became a juried member in 1989, and participated by showing her line of handbags. There, she had the opportunity to meet Paul Mathews, owner of the Cordwainer Shop. Within a few months’ time Molly was traveling to craft shows nationally with Paul and learning the Cordwainer art. Molly still makes handbags, but the main business is teaching shoemaking workshops at the Deerfield, New Hampshire shop and at craft schools across the country. The Cordwainer Shop was founded in the 1930’s by Edward F. Mathews. His son, Paul, carried on the shop tradition as main footwear designer, and except for a 4-year stint in WWII, shoemaking became his life’s work and joy. Many of his footwear designs are still produced at the shop today. Molly Grant now carries on the Cordwainer tradition of creating custom handmade leather footwear, and it has become as much a passion to Molly as it was to Paul. She specializes in teaching shoemaking workshops as a way to share this tradition of craftsmanship.